An Actual Survey, of the Provinces of Bengal, Bahar & c. by Major James Rennell Esq. Engineer to the Honorable the East India Company. Published by Permission of the Court of Directors from a Drawing in their Possession by A. Dury. 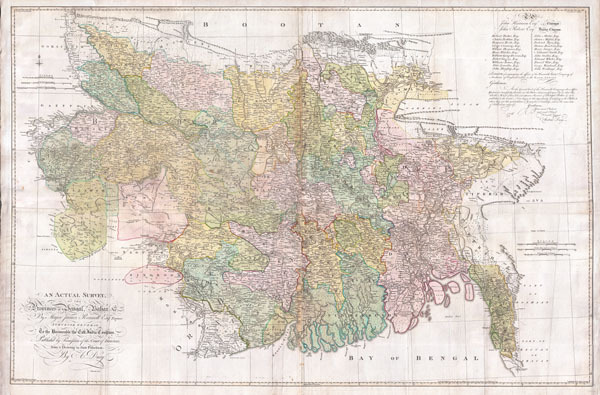 An altogether spectacular wall sized map of those parts of Bengal and Bihar, India. Follows the course of the Ganges River from Varanasi (Benares) eastward to the Ganges Delta and the Bay of Bengal. Includes Varanasi (Benares), Dacca (Dahka, Bengladesh), and Patna among many other important Indian cities. Bounded on the north by the Himalaya Mountains and the border with Bhutan. One of the first accurate maps of the interior of India. Laid out from primary surveys done by James Rennell, the first modern cartographer to map the interior of India. Notes cities, markets, battlefields, fortresses, roads, rivers, offers political commentary, and features some geographical references. Elaborate title in the lower left quadrant. Upper right quadrant features a dedication and letter of thanks written by Andrew Dury, the publisher, to the board of the East India Company. This is the first edition of this rare map – 1776 – as published by Dury. Later editions were published by Sayer and Bennet and by Laurie and Whittle. Andrew Dury (fl. 1742 - 1778) was a London based engraver and map publisher working in the mid to late 18th century. Little is known of Dury's life, however, his imprint often appears on the work of a number of prominent London publishers from Sayer and Bennet to Laurie and Whittle and Gentlemans' Magazine. At some point, from 1754 to 1757, he also seems to have had an office in Dublin where he worked with John Rocque. Very good condition. Four sheets joined. Full professional restoration. Margins added. Backed with heavy linen.